being little • bristol uk fashion & lifestyle blog. : chocolate chocolate teacake. You might've seen me mention on Twitter/Facebook that it's chocolate week! 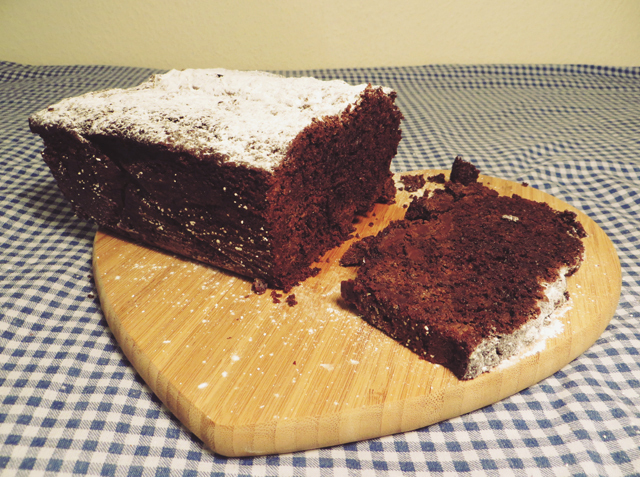 I thought this would be a good excuse to bake this super rich chocolate loaf that I've been drooling over for a while. The word "chocolate" is in the name twice for a reason.. It has cocoa AND dark chocolate in it! I usually make cupcakes, or round cakes with some kind of creamy filling, so I was worried that this cake would be a little dry - but it's not! It's perfectly moist with nice bit bits of dark chocolate (although these seemed to sink to the bottom). The cake is very rich, made even more so by the strong coffee you add in, so you only need a little slice. I recommend serving with a bit of cream or a cool glass of milk! I've also seen a lot of people say in the reviews on Amazon that in this Huckleberry book, the conversions from cups to grams are a little off, so make sure you measure everything in cups to get it right! You can get them in loads of shops for super cheap - I got mine from Asda, but I've seen them in Wilko & Poundland too. • Grease loaf tin, line with greased baking paper (allow paper to extend further than sides of the pan for easy removal later!) & dust with cocoa. 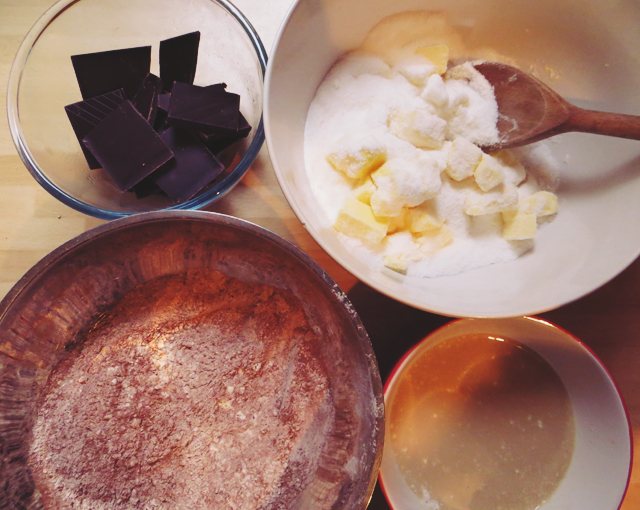 • Sift together the flours, cocoa, baking powder and bicarb, and set aside. • Combine the coffee, buttermilk and vanilla, and set aside. 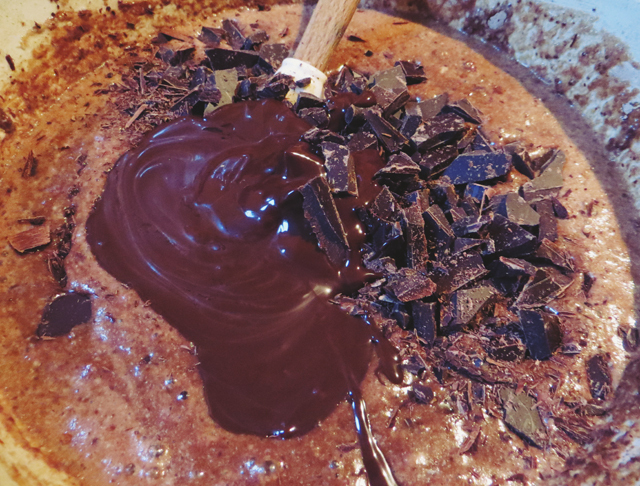 • Melt 3/4 cup of the dark chocolate. • Cream the butter and sugar until light and fluffy. • Add the eggs one at a time to the butter & sugar, mixing thoroughly after each one. • Gently add in the flour mixture a little at a time, until just combined. • Stir in the coffee mixture. • Fold in the chopped and melted chocolate. • Pour into the loaf tin and bake for 50mins, or until a skewer comes out clean. • Leave to cool completely in the tin before removing & dusting with icing sugar. Are you eating anything indulgent for chocolate week? That looks fantastic- and anything with chocolate in the name twice appeals to me! Having the chunks of dark chocolate is such a great idea. 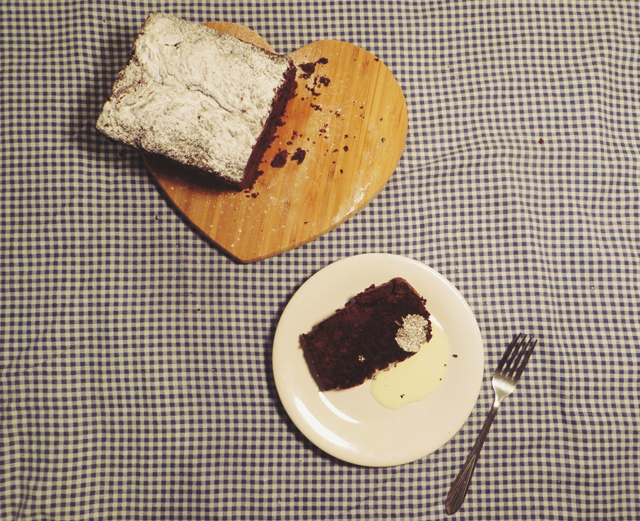 I baked a chocolate, almond and orange cake last week and shared the recipe today- coinciding perfectly with chocolate week! Ughhh, everyone's delicious holiday recipes are slowly killing me! I'm gluten-free vegan, but hey, that doesn't change the fact that this cake looks so good and I am drooling over it. WOW, I LOVE THE CHOCOLATE!! !